The turtleneck is the great Abracadabra of our wardrobes. Want to be a Panther, an intellectual, a beat? The turtleneck can get you there. Wildly underestimated, there is no equivalent in terms of a piece that can keep us warm, and at the same time, tight. But like the boot and the winter coat, the right one can be surprisingly elusive, or worse, extraordinarily expensive. The Ladies offer twenty-seven options (on a sliding scale), that will get you where you need to go. Tucked into ancient Levi's or a beautiful suede skirt, or stashed in your bag, then layered over a slip dress, the turtleneck is unerringly dependable, our eternal problem-solver. “Dressing Right” by Charles Hix, 1978. This familiar neckline has a tubular, high turned-over collar that folds as many as three times while hugging the throat. Most sweaters are pretty tough, requiring little special care other than the occasional trip to the dry cleaners. But don’t hang them on hangers, they’ll lose their shape. However, though durable, they shouldn’t be subjected to unnecessary abuse. They can lose some of their dimensional stability when carelessly pulled on and off. 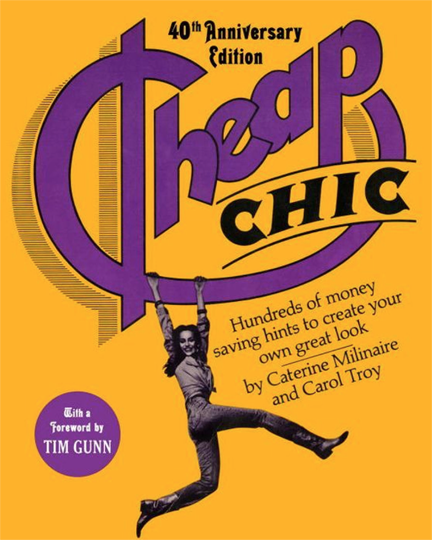 “Cheap Chic” by Caterine Milinaire and Carol Troy, 1975. When it gets chilly, turtlenecks are warmer than the basic T-shirt design. Army surplus stores carry cheap long-sleeved turtlenecks in cotton knits, but they tend to bag, and sometimes the elastic in the cuffs and neck start to give and curls out of the cotton like little worms after a morning rain. A really sturdy turtleneck is more expensive, perhaps $15, and comes in a stretchy synthetic mix like nylon and Lycra. These fit beautifully, and the neck never gets worn out from all that on-and-off stretching. They’re worth the price, but be sure to get bound seams for your money. When they reach the end of their life, synthetics start to run at the seams, but this isn’t for several years of daily wearing. A black T-shirt or turtleneck with a pair of black pants can take you almost anyplace, from jogging in the park to dinner at the finest restaurants. “Lyn Revson's World of Style: How to Join It and Live It” by Lyn Revson, 1977. Once you’ve got the black skirt and white silk shirt, your next purchase probably should be a turtleneck sweater. Again, buy a good one: wool or cashmere if you can afford it. And have it in a color that you won’t tire of easily. This last bit of advice is very important if you don’t own a lot of clothes. Red might be your favorite color, but if your wardrobe is small you might be wearing that red sweater several times a week. Do you love red that much? Norman Norell’s advice was to start out with the neutrals: black and white, followed by beige and gray. They all work beautifully together, and you don’t get tired of them easily. Back to the sweater. Wear it alone with the black skirt. Or layer it under the white silk blouse. The result is another great daytime look, perfect for work, or for shopping or lunches.